Today’s cookie was inspired by an old Pampered Chef recipe which called for one of their special batter bowls, a stoneware pan, spatula spreader and probably another product I missed while scanning the directions. What I was interested in was the dough, which turned out to be a great vehicle for miscellaneous Halloween candy. It baked up into not-too-sweet, crunchy-edged, medium-thick cookies. Just for fun, I tested the dough with Kit Kat chunks, Twix chunks, Snickers and M&M’s. I don’t recommend the Twix because the caramel melted all over and the cookies weren’t attractive. The Kit Kat cookies were just plain weird and the Snickers were okay, but would have been better with peanut butter. What worked really well were M&M’s (of course). I think Rolos or Milky Way would work too. Beat butter and brown sugar until creamy. Add egg and vanilla; beat well. Beat in baking soda and salt. Add flour and stir until it is mixed in. Stir chocolate chunks into the dough. Cut candy bars into small pieces and stir some of the pieces into the dough. Bake 14-16 minutes or until cookies are almost set. Do not overbake; centers should be slightly soft. Cool on baking sheet for about 7 minutes before transferring to a cooling rack. These cookies would be great baked in a muffin top baking pan don’t you think? Now I know what to do with all my leftover Halloween candy. I’m going to make these and give to my family at Thanksgiving. I found some great cello bags with leaves on them at Box and Wrap…they will be perfect. These were fantastic! I have made them a few times by now, and I think I’ve finally got them right. I used dark brown sugar instead of light because that’s what I had in the house 🙂 Also.. 1/4 cup of dough for one cookie?? Really? I tried that the first time and they came out a mess 🙁 I think I did something wrong. I’ve been making them with a heaping teaspoon or tablespoon, and that works. Ohh I also did these by mixing in mini reese cups broken in half. Deee-licious! Thanks for the recipe! I can’t wait to try more from your site. I don’t really get the concept of “leftover” Halloween candy. Isn’t it always in the process of being eaten? Like over the course of 3 days at most? Especially the chocolate. Still, these cookies look yum, yum, yummy! CC, I think you’d like these. However, I see you taking them to the next level. Katrina, yes, I’d leave them whole. Caramel would be a good addition. It just didn’t look good melted on top. Karen, Recipegirl has a recipe where Kit Kats are crushed, patted into a crust, then topped with cheesecake. It sounds good. I haven’t been in a cheesecake mood lately, but that seems like an interesting use for Kit Kats. Sue, the one to the right of the M&M cookie is the oddball Kit Kat cookie. Joanna, I can’t think of anything on your blog that doesn’t look pretty. You must care ;). Baking Blonde, it would be fine — it’s very similar. I think the candy is what makes this dough special, though. Michelle, thanks! I hope you can find some good Christmas cookies. I don’t make a lot of fancy party style cookies, but I think most of these cookies can be arranged nicely on a tray. Katy, Sue gave me a Junior Mint browie recipe a while back. I need to try it. Thanks for the tip on Recipegirl’s molasses cookies. I like peppermint patties, Andes mints or Junior Mints in brownies. Also, check out the molasses cookies with Sugar Babies on recipegirl.com. They sound fantastic! My friend Tonia makes a peanut butter cookie wrapped around a snickers mini so it looks like a dough ball precooked. They are pretty much the best cookies ever! I love all your cookie recipes. Your site will help for the cookie exchanges I attend at Christmas. I love throwing leftover candy into blondies, cookies and brownies! Those look tasty! I wonder how the dough would be for plain old chocolate chip cookies?? I am on the look out for a new recipe to try. 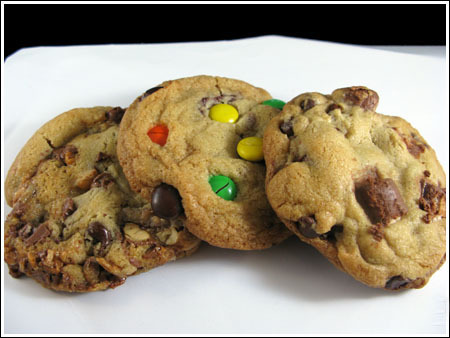 The M&M cookies are really attractive. I like the looks of the cookie to the right of the M&M cookie too. Thanks for the heads up on the Kit Kats. I have a bunch of them left (and Snickers and Crunch bars and a few random other candies) and I’m glad to know not to put them in cookies! I’m gonna do a cookie or bar with my leftovers sometime this week, but I will leave the Kit Kats out! Rolo’s have caramel, too? Would you just leave them whole? And Milky Way does. These cookies look yummy! My favorite candy bars might just be Twix–because it has COOKIE, of course! Loving cookies AND candy I can see myself really liking these!